Top 10% EPD on 6 traits! White yearling male. Railsplitter, 2015. Third place in a tough class. Enjoying the wrong side of the fence. AFD -1.469 0.301 1127 of 19048 Top 6 percentile! SDAFD -0.416 0.3 1105 of 19048 Top 6 percentile! SF -1.546 0.304 1016 of 19048 Top 6 percentile! %F>30 -5.823 0.309 937 of 19048 Top 5 percentile! MC 3.378 0.302 1290 of 19048 Top 7 percentile! SDMC 2.041 0.316 430 of 19048 Top 3 percentile! He is turning out fantastic and we couldn’t be more delighted! 18.5 micron fleece at 1.5 years. 15 micron at 2.5 years. 15.6 micron at 30 months with a 100% comfort factor. Absolutely stunning fleece, soft, bright and consistent. Every judge has commented, “Consistent.” More consistent than the male placed higher, which has always taken champion. These numbers put Leo in the EPD TOP 10% for fiber diameter and SDFD. We are offering three introductory breedings in 2017 for $500. Our philosophy is that excellent genetics should be available to all breeders. We are breaking from the high-priced fashion and pricing Leo at an affordable rate so that even the small farms can improve their fiber, for the betterment of the entire industry. What is the catch? The catch is that these breedings are strictly limited. We believe that success comes from a well-executed plan. If YOUR plan is for fantastic genetics and superior fleece then plan ahead and reserve one of the very limited outside breedings. Stud fee is for Drive-by breeding and limited agisting (21 days). After this period, agisting is $3/day. Dam owner is responsible for all CVI and vet costs, including ultrasound. After the introductory period Leo will be closed to outside breedings. We feel that Leo will bring long-lasting consistent fleece characteristics along with excellent conformation. The animals in his pedigree reached their pinnacle after maturity, at 4+ years of age indicating lifetime quality in this package. Leo inherited excellent traits from his multiple banner winning sire, Light Sabre, a son of the one and only, Mister Antonio. Light Sabre is a MULTIPLE JUDGES CHOICE winner with an impressive collection of Champion banners. This son is clearly following in his father’s footsteps. We are a very small farm and not heavy on the showring circuit, but Leo has competed very well against high-caliber showring professionals. And look at the genetics on his maternal side. Breathtaking. A daughter from a Mister Antonio female crossed with My Peruvian Obsession, son of the legendary Pperuvian Dracula! Leo is an outstanding young guy and we cannot wait to see how he develops. Leo earned 2nd place yearling male at the 2015 America Alpaca Showcase and 2016 RailSplitter Alpaca show, immediately behind the color champion. 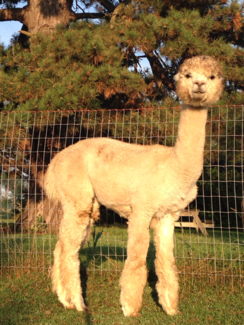 He also took 3rd place in a highly competitive white yearling male class at the 2015 Railsplitter alpaca show. Stop by to take a look at him or request a fleece sample. We are booking breedings for next year. Limited introductory rates. Half Interest in this male is available. We aren’t letting this one get away!